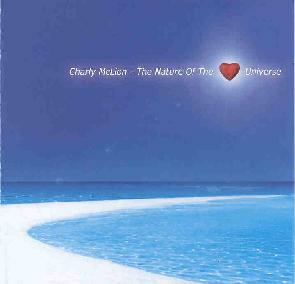 Charly McLion - "The Nature of the Universe"
There's a lot to be said for how an album is packaged. With its tranquil, sandy beach and glowing heart on the cover, and overly new-agey song titles like Dance of the Elves and Rainbow Kiss, Charly McLion's album could easily be dismissed as new age mush by the discriminating space rock fan. Now had the album been given a psychedelic cover and decidedly trippy song titles, it may have been recognized for what it is. McLion has been active in music since the 60's, inspired by artists such as Pink Floyd, Amon Düül II, and Caravan, he's played everything from blues and rock and to folk and film soundtrack music. The back cover of The Nature of the Universe calls the album's music "interstellar, but not overdrive" and this is an apt description. Much of this album is reminiscent of the mellower, instrumental parts of latter day Pink Floyd. Even McLion's guitar has a Gilmour-esque ring to it; its sustained notes are smooth, melodic, and flowing. It would be easy to dismiss this album as just another new age album, but that would do it an injustice. Yes, it's mellow and relaxing, but it has the power to draw the listener into its space, and takes adventurous turns that new age musicians have a tendency to avoid, such as the whirlwind space textures of Midnight Summer Rain, the trancey hip-hop rhythms of Eye in the Sky, and the psychedelic guitar licks on Dream Catcher. McLion wisely keeps the focus on the guitar throughout, allowing the backdrop of lush synthesizers and drum machine rhythms to support his subtle style, rather than overwhelm it. The only misstep McLion takes is including some unnecessary female vocals on the album's final track, Sunshine. According to the Kingfisher web site, McLion is currently working on a more trance-oriented album. It could prove to be an interesting work if he continues to focus on his excellent guitar playing, while picking up the pace of his music with some exciting techno-rhythms. We will have to wait and see. But in the meantime, ignore the new age pretensions of the packaging, and trip to The Nature of the Universe. For more information you can visit the Kingfisher web site at: http://www.kingfisher-records.com/. Contact via snail mail c/o Kingfisher; Suedstraáe 56-58; 52064 Aachen; Germany.